The Bachelor of Science (Blended) is a new degree at Savitribai Phule Pune University, India, that has been developed in close collaboration with the University of Melbourne, Australia, and the Indian Institute of Science Education and Research (IISER) Pune, India. The program is geared towards students who intend to proceed to postgraduate study, and it is designed to deliver a highly integrated and strongly foundational training for the STEM (Science, Technology, Engineering, Mathematics) student of the future. This innovative new curriculum integrates the four major disciplines of science (mathematics, physics, chemistry and biology) into a common curriculum for all students for two years, followed by a strategic but diverse choice of major streams in third year. Complex topics will be integrated across subjects, and key elements of different discipline subjects will be coordinated for maximum impact. Online resources will support the on-campus teaching and to unify the program across the different colleges. Careful sequencing and integration of topics across disciplines will ensure that the learning outcomes of first and second year subjects are optimal for a transition to any major, and that students proceed to their chosen major with a solid grounding in the four fundamental pillars of science. 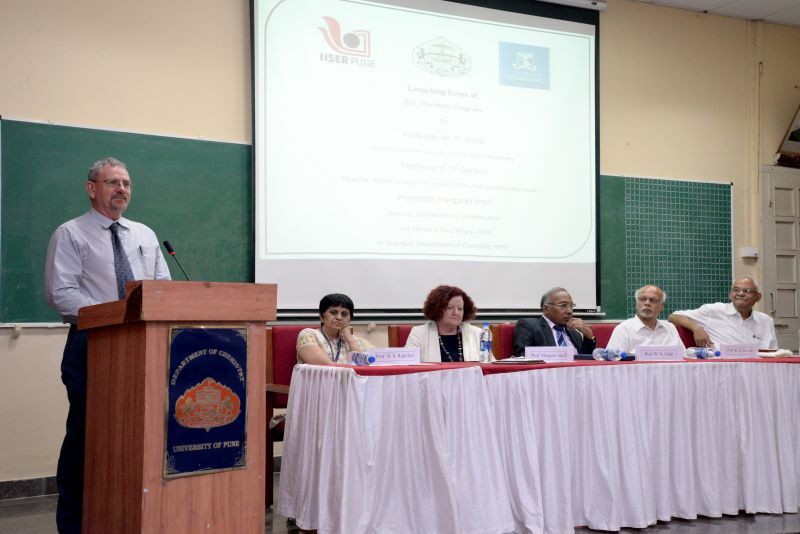 A central part of the program will be ongoing support for teaching institutions and their staff (the undergraduate colleges affiliated with University of Pune) to develop an enhanced capability to deliver this high quality undergraduate education; this will include both pedagogical and discipline based support. As well as underpinning the traditional science disciplines, this degree will prepare capable students for emerging fields such as biophysics and computational biology, and the more established areas of interdisciplinary study such as environmental science. Learning outcomes, graduate attributes, and academic standards will be explicitly articulated and monitored, and examinations and grading will be benchmarked with similar cohorts of students from University of Melbourne and IISER Pune to ensure equivalence of standards. This quality assurance (backed jointly by University of Melbourne, IISER Pune and SPPU) will provide enhanced international recognition that will make this degree competitive in an international market place. The University of Melbourne will recognise the BSc (Blended), and graduates will be eligible to apply for postgraduate Science programs at the University of Melbourne on an equivalent basis. The University of Melbourne will also promote the quality assured credentials of the BSc (Blended) to support students who wish to explore postgraduate options at other institutions. BSc (Blended) graduates will be eligible to apply for relevant MSc programs at SPPU. In particular, students graduating with a major in Life Science will be eligible for MSc in all biology disciplines. SPPU and IISER Pune will promote the quality assurance credentials of BSc (Blended) for students who wish so explore postgraduate options at other institutions in India.